NEW YORK – It isn’t just Israel that is celebrating its 70th anniversary this year. Trinity Hillel, located on the campus of Trinity College in Hartford, is marking the very same milestone this very same year. The organization kicked off its 70th anniversary celebration on Tuesday evening, March 27 with an elegant event attended by hundreds of guests, held at New York’s Museum of Jewish Heritage. 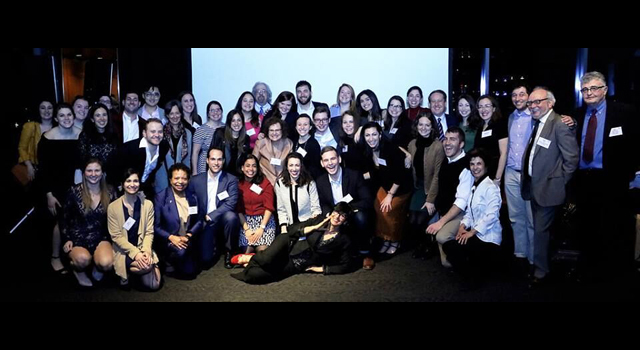 There, overlooking the New York Harbor and with the Statue of Liberty and Ellis Island as a backdrop, supporters celebrated the organization that for 70 years has helped to mold Trinity College students into Jewish leaders. 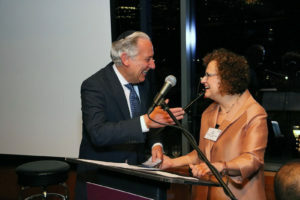 “It was fantastic,” said longtime Trinity Hillel Director Lisa Kassow, who noted that the event was held in New York City to accommodate the many Trinity alumni who now live there and were eager to attend the celebration. The March 27 celebration included docent-led tours of the museum and a special sneak preview of “Who Will Write Our History?” a film by Roberta Grossman and Nancy Spielberg, based on the book of the same name by Dr. Samuel Kassow (’66), the Charles H. Northam Professor of History at Trinity and Lisa Kassow’s husband. 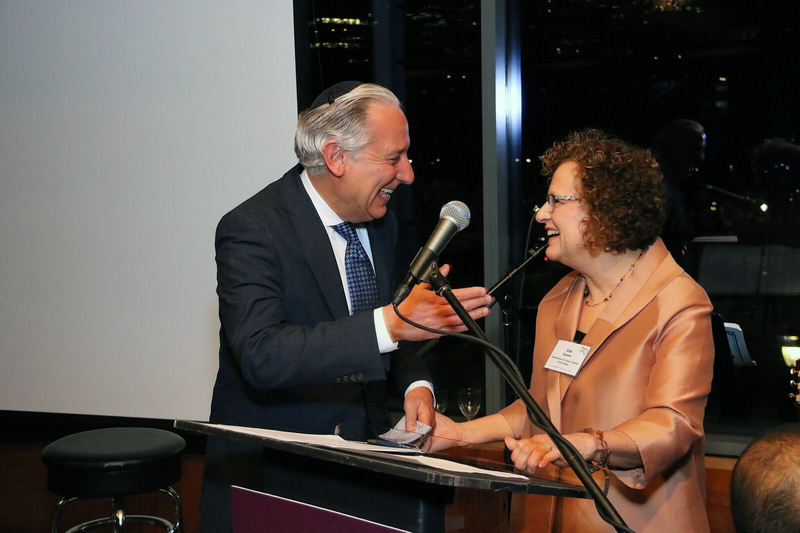 Hillel President and CEO Eric Fingerhut with Lisa Kassow, Trinity Hillel Director at the 70th anniversary event in New York. Also in attendance was Eric Fingerhut, president and CEO of Hillel: The Foundation for Jewish Campus Life, who praised Lisa Kassow for her work with Trinity Hillel over the past 17 years. That evening Kassow announced a $1 million endowed gift from an anonymous donor family. “This is a major gift that will endow the Trinity Hillel director’s salary in perpetuity,” said Kassow, a recent recipient of the Richard M. Joel Exemplar of Excellence Award, presented by Hillel International for excellence in engaging students and building dynamic Jewish communities on campus. A photograph from the 1948 Trinity yearbook of the first members of what was then known as the B’nai Brith Hillel Society of Trinity College was blown up and on display. David Rifkin, one of the founders seen in the photo, was in attendance at the event. In the 70 years since Trinity College Hillel was established, its mission has evolved. During the early years, the members met monthly to socialize with other Jews. They did not hold services or celebrate holidays on campus. Sometime in the 1960s, Rabbi William Cohen z”l, then the spiritual leader of Beth David Synagogue in West Hartford, served as part-time Hillel director and began leading Talmud classes. Today, Trinity Hillel is a strong presence in campus life, providing regular Shabbat and holiday observances, and a focus on Jewish culture, Israel, the arts, Holocaust education and social action, aka tikkun olam. Rabbi Daniel Freelander (’73), who today serves as president of the World Union for Progressive Judaism, introduced Trinity President Joanne Berger-Sweeney at the event. Also attending were Alan Mendelson (’69), chair of the Trinity Hillel Advisory Board, and Henry Zachs (’56), the Hartford businessman and philanthropist who along with his family built and endowed the Zachs Hillel House on Trinity’s campus. Zachs is also publisher of the Connecticut Jewish Ledger. Since it was dedicated in 2002, the 8,000 square-foot Zachs Hillel House – which includes a kosher kitchen, dining room, library and multipurpose space for prayer – has become the focal point of Jewish life at Trinity. Sharing a 70th birthday with Israel made the celebration even more special, Kassow said. CAP: Current Trinity Hillel students at the 70th anniversary celebration.